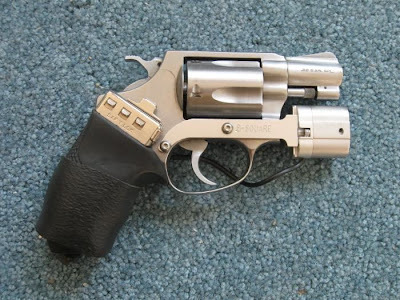 Will a single shot .410 turn around a threat? 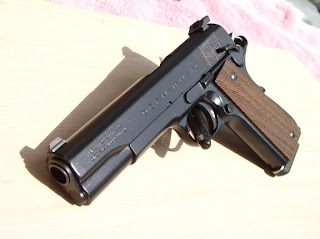 The 1911 is an Argentine Sistema refinished in black duracoat. All springs replaced. New wood grips. TruDot night sights. Extended beavertail and thumb safety. 300-rd count. Includes 3 old Metalform mags, and 3 8-rd Kimber mags. Also includes 50 rounds Remington JHP ammo and 63 rounds American Eagle FMJ ammo. I like it because it exudes old-world charm. It is an old-time 1911! I use a modified Sistema for CCW. It's a gun that I custom tailored to fit myself. It's a good, reliable gun. I also own a rearsenaled Sistema, and an original finish Sistema. I enjoy the Pistola Sistema Modelo Argentino 1927 as shootable historic pistol, and I am a bit of a student of it's history. I have modified them, worked on them, and shot them. Please allow me to dispel a few myths. First, the Colt Model 1927 Sistema was not made from steel from the Admiral Graf Spee, a nazi battleship scuttled in shallow Argentine waters during World War II. 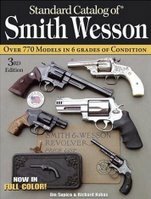 They were made from high quality steel from the period to Colt's original specifications. Yes, the steel of a Sistema is softer in places than modern 1911s. 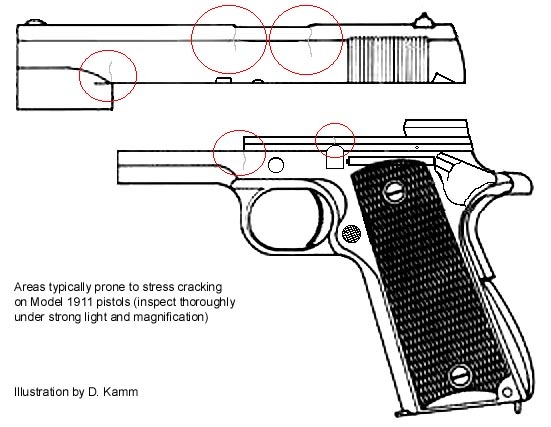 This is because all 1911s from the time the Colt Sistemas were made were tempered only in specific areas of stress after the part was machined. Today's 1911s are CNC machined from tempered steel. Thus, the entire frame and slide is tempered. I have installed custom fitted beavertails on Series 80 Colts and on Sistemas. I can say without equivocation that the frame tangs on the Sistema ground down surprisingly easy. The thing is, does this matter? Yes and no. One Sistema I worked on had to have the magazine well opened up a bit because it had collaped slightly under the weight of a truck. You could shove a magazine in, but it would not drop free. I don't rotinely drive trucks over my guns, and I advised the owner of that pistol to reserve that kind of treatment for Glocks. Incidentally, I used a small hydraulic C-ram to open up the magwell. I would not alter the ejection port of a Sistema. That area is one of the hardened areas, and I wouldn't want to get close to the softer steel. The same goes for any part of the front of the slide or the frame around the slide stop pin. This specific pistol, from the slide import mark, appears to be one of the last shipments of Sistemas, known in collector circles as the Lipsey shipment. These were bottom of the barrel examples imported in 2006, and were probably the last ones out there. Many were sent back to Lipseys for a refund by those collectors who ordered them. A lot of those same collectors now kick themselves. The Lipsey guns were, in general, excellent candidates for custom 1911s such as this. They were basically in the white, no finish left, but complete with steel small parts, and they were cheap. Many were made into custom 1911s. 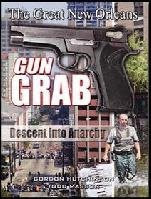 That brings us to custom 1911 territory, or really, custom any kind of gun territory. Such a firearm is only as good and reliable as the man who made it. This is why I took a Colt Commander to Jim Clark Jr. for a melt job even though I own a belt sander and a vise. Could I do the job he did? Yeah, maybe, if luck was with me. Could he do the job he did? Definitely. Was it worth it? It was to me. I got to pick exactly what I wanted and how I wanted it done. That is what a custom gun is. 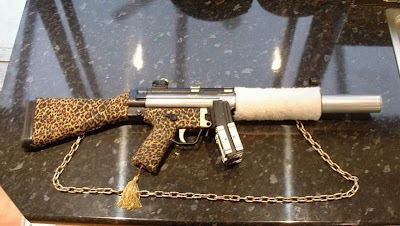 A custom gun is not a 1911 that a gunsmith, no matter how talented, put a beavertail on along with some other goodies in hopes that he might find a buyer. A custom gun is a gun that is made to the needs and specifications of a specific buyer, like a custom suit or shirt. Anything else may be nice, but it was not tailored to you. 1. What barrel is in it? 2. Is the sear and disconnect original? 3. I would expect the springs had been swapped out. 4. Why was an arched mainspring housing swapped out for an arched mainspring housing? I would inspect it very carefully in the usual GI M1911 stress areas. Duracoat can cover a lot of things. In fact, since I know a shooter who is a radiologist I would probably place it under a C-arm and look at it under flouro. 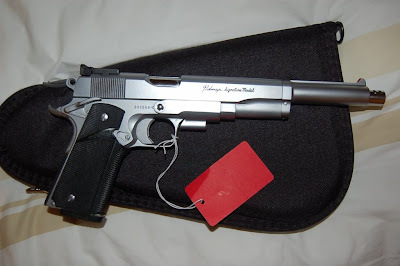 With a collectible M1911 I wouldn't go to that length, but on a GI gun that would see significant range time in my hands, since I have the ability, why not? Especially if it was Duracoated instead of blued or parkerized. Finally, I would expect to shoot the gun to establish reliability and to see if I like it. That's a benefit of buying any used gun, along with the reduced price. This pistol is a shooter. I could be a very nice shooter, and a wonderful carry gun. To answer the question of whether I would make this specific trade....... Yes, as long as there were no cracks in the Sistema's frame or slide. Why? I like 1911s, and I don't care for Glocks. That is the only reason. Glocks are generally reliable, but not infallible. So are 1911s that retain a mil-spec frame/slide/barrel relationship. Both camps have devoted and blind disciples. I am here to say I have had my tail waxed by bearers of Gaston's finest, but I've shown a few plastic fantastics what 1911 supremacy is all about a few times too. I like 1911s because they help me shoot better than I ever thought I could. I carry a 1911 because I shoot better with them, and I believe in a self defense situation, effective shot placement (including depth) to stop the threat is more important than caliber, action type, brand of gun, scent of aftershave, or any other factor, except perhaps speed. The 1911 gives me the most speed and the most accurate shot placement. The Glock does the same for other folks. 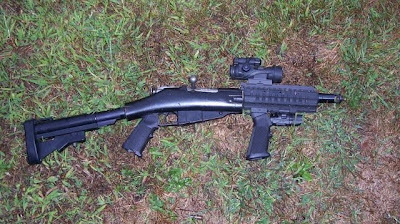 Chances are, the only thing I would do to this gun is swap out the sights for Novaks. From what I can tell from the photographs, the workmanship appears to be competently performed, and wise choices have been made as to where to stop the modifications. Learn more about Sistemas here. 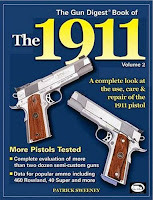 Learn how to thoroughly check out a used 1911 here. The Laryngospasms will be performing at the "Sputum Bowl," put on by the American Association of Respiratory Care (AARC) in San Antonio, Texas on December 7, 2009. 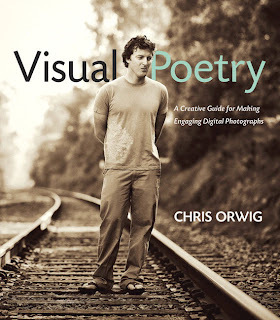 "Visual Poetry: A Creative Guide for Making Engaging Digital Photographs" by Chris Orwig is an excellent read, although the author can get a bit verbose. The author makes good points though, and he wants his reader to understand and appreciate them. That can lead to tedious nit picking. Visual Poetry never reaches that level. The concepts Orwig discusses are often lost on those who believe good photography comes from equipment. In fact, good photography no more comes from the latest and greatest Nikon than great paintings came from Rembrandt's brushes. The masterpieces came from the master's mind and soul, not his equipment. These are the ideas that Orwig harnesses and unveils in this work. The creative process is a mystery to many people who have never studied the arts or investigated the artistic mind. Digital cameras have brought photography out of the darkroom and into the lap of anyone with a computer. Still, the snapshots many people take are just as common as those thirty years ago. "Visual Poetry" can give the uninitiated amateur photographer the first look, and a decisive look, into the creative process of making captivating images. After all, it is the photographer who must be developed, not just the image. "We get robbed here all the time, we're used to it living in this neighborhood," said a Houston homeowner who shot a burglar through his bedroom window on October 16, 2009. "I shot him, but I shot him on his foot. I didn't want to shoot him in the chest or head or anything, he was five feet away from me, I could have shot him between the eyes but I didn't want to kill him," said the homeowner. Although it is listed as a non-removble focus screen, the focus screen on the Nikon D200 is removed in the same fashion. I followed this procedure when I replaced it with a Katz Eye screen. Rick Glen Strandlof is a posuer. He tried to pass himself off as a United States Marine with injuries from Fallujah. He claimed three combat tours in Iraq. He claimed to be a survivor of the September 11 attack on the Pentagon. He claimed he was a graduate of the U.S. Naval Academy. He claimed to have been decorated with the Purple Heart. Rick Glen Strandlof never spent a day in the military. 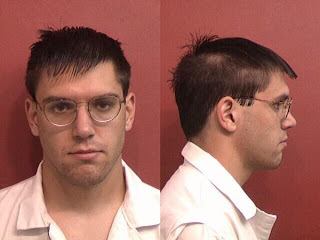 A federal arrest warrant has been issued for Strandlof. He will be prosecuted under the Stolen Valor Act of 2005. His actions are punishable by a year in jail and a $250,000 fine.